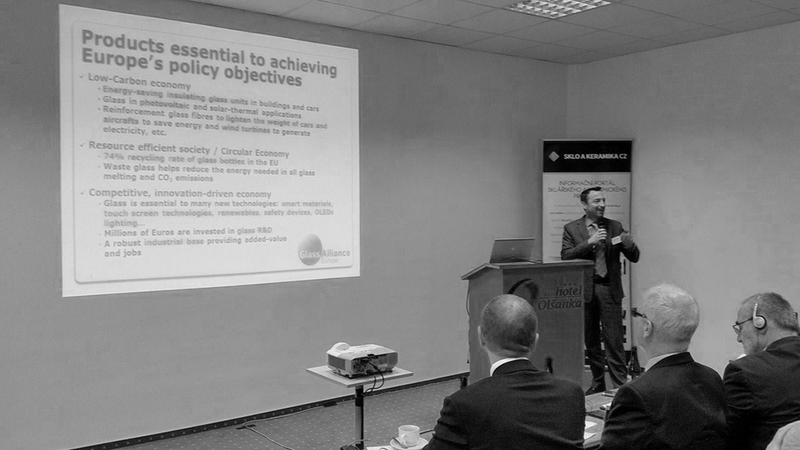 As Glass Alliance Europe‘s Secretary General, Bertrand Cazes participated to a workshop organised by ASKPCR, the Czech Glass & Ceramic Association on 15 February, where he presented an overview of the different glass sectors in the EU. The workshop aimed to shed some light on “The Future of the Glass and Ceramic Industry in the Czech Republic and in the European Union” and offered an opportunity to exchange on the state of play of the EU glass industries and challenges ahead. The discussion panel was very rich and included Labour Unions representatives from Italy, Belgium,Slovakia and the Czech Republic as part of a two-year social dialogue platform that has been in place in the Czech Republic. This event also offered the opportunity of a dialogue with the Czech Vice-Minister for economy and two Czech Members of the European Parliament on ETS carbon leakage protection, electricity costs, food contact materials and recycling. Over 50 participants from different EU countries took part to the event, among which, the President of ASKPCR and representatives from Cerame-Unie and IndustriAll.